A recent charity event held at leading radiator manufacturer Stelrad, in Mexborough, saw staff at the company raise £878.74 for a hugely worthwhile charity – Marie Curie Cancer Care. The major fund raising activities included a huge raffle with a wealth of excellent prizes and a massive ‘cakes and buns sale’ which not surprisingly seems to have caught the imagination. Staff members were generous in donating raffle prizes and perhaps inspired by the Great British Bake Off – bakers across the company turned up with possibly the widest range of cakes and buns ever seen on an industrial site! The event was pronounced a huge success – and one to be repeated hopefully if it generates that many cakes again: “It was extremely well supported – both in the provision of prizes and cakes and particularly in the eating of the cakes,” said Martin Lichfield from Stelrad’s Credit Control Department. 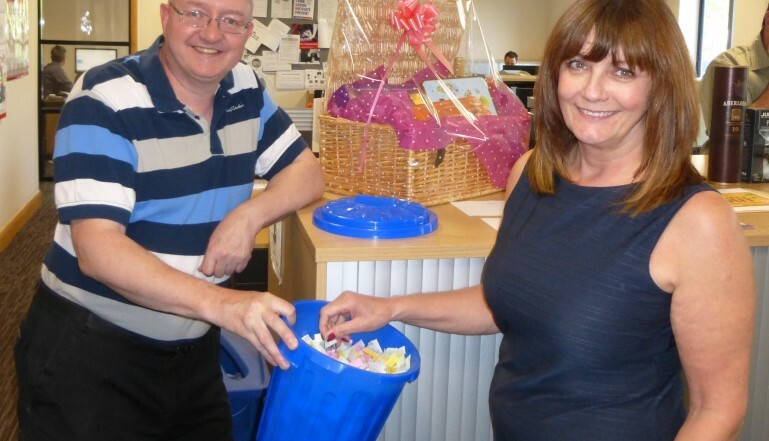 Martin Litchfield, Credit Control Team Leader and Margaret Bitcliffe, Contract Support Team making the big draw! !